Series Virtue: Wisdom – Finding out what you should do and doing it. Main Point: If you want to be wise, hang out with wise people. Our series “Eliminator” has been all about making wise choices in the different areas of our lives. This week, we learned that if we want to be wise, we need to hang out with wise people. Our Bible story was Rehoboam and we saw how he had a choice of who to listen to – a wise group of advisors and an unwise group. Unfortunately, he chose to listen to the unwise group of advisors and it hurt his reign as king. In our lives, we get to choose what people we spend time with and we need to make sure we choose wise people and people who will make us more like Christ. 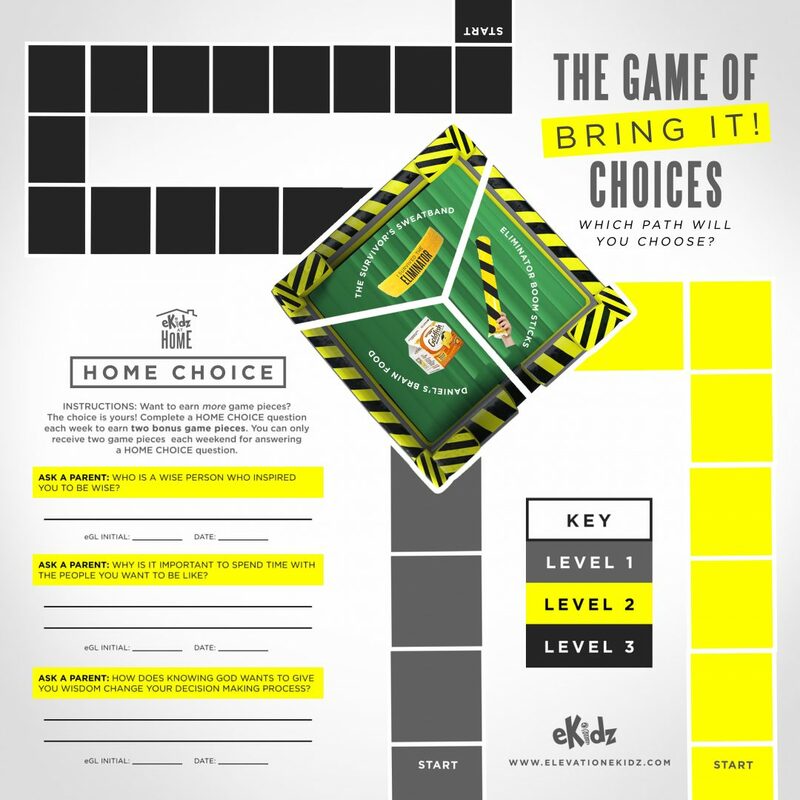 We are giving your child a choice for the Bring It! Challenge through The Game of Bring It! Choices. Each weekend by “bringing it” your child will get closer to reaching the Eliminator and the prize for the path they choose. They can fill up any path by collecting game board pieces for attending Motion, bringing their Bible, saying the memory verse, bringing a friend, and for completing a Home Choice question. Help your child remember to bring back their game board every week so they can continue to earn game pieces. Prizes will be awarded the last weekend of the series, March 28/29.